The Conspicuous Gallantry Cross is awarded to The Royal Irish Regiment. Cpl Clare Withers, whose father was the last member of the Regiment to be killed by terrorists, receives the Conspicuous Gallantry Cross, on behalf of the Regiment, from Her Majesty The Queen. 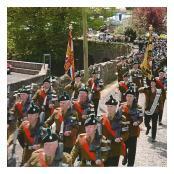 On the 6 October 2006, Her Majesty The Queen awarded The Royal Irish Regiment the Conspicuous Gallantry Cross in recognition of the bravery, sacrifice and service of the Home Service battalions of The Royal Irish Regiment and their forebears, The Ulster Defence Regiment. 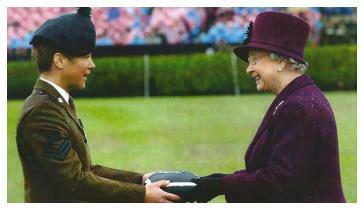 At precisely 1100 hours, The Queen stepped from her car at the Balmoral Showgrounds to be greeted by the Lord Lieutenant for the City of Belfast. This was the start of a proud day for the Regiment as Her Majesty arrived for the Queen's Review and Final Parade of the Home Service battalions. 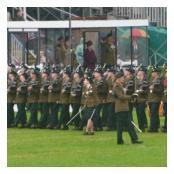 On parade were the Regimental Colonel, Colour Parties and Guards from the 2nd, the 3rd and the 4th Battalion The Royal Irish Regiment, and a Guard from the Regimental Associations of The Ulster Defence Regiment along with the Band, Bugles, Pipes and Drums and the Regimental Mascot, Brian Boru. Rain began to fall as The Queen arrived and continued throughout the parade. Senior officers, many of whom had served with the Regiment, dignitaries from all walks of life, members of the associations, families and bereaved families watched as The Queen inspected the parade. The high point of the parade was the presentation of the Conspicuous Gallantry Cross which was received by Corporal Clare Withers on behalf of the Regiment. This was followed by an immaculate march past in slow and quick time before the Regimental Colonel sought permission from The Queen to 'March off' for the final time. After the parade, The Queen and The Duke of York met many members of the regimental family including the widows, bereaved parents and disabled former members of the Regiment. Over lunch, the Colonel of The Regiment presented The Queen with a white gold brooch fashioned after the regimental crest and encrusted with diamonds. Thus ended both a proud and sad day for the Regiment as the Home Service Battalions marched off into history with the Conspicuous Gallantry Cross emblazoned on the Regimental Colours of The Royal Irish Regiment. 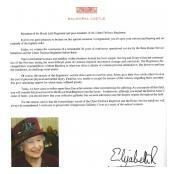 Below; more images of the parade and the text of HM The Queen's presentation address.